Welcome to our Laboratory ! Xie Y, Ding WG, Liu Y, Yu M, Sun X, Matsuura H. Long-term 4-AP treatment facilitates functional expression of human Kv1.5 channel. Eur J Pharmacol 2018 Dec 12;844:195-203. 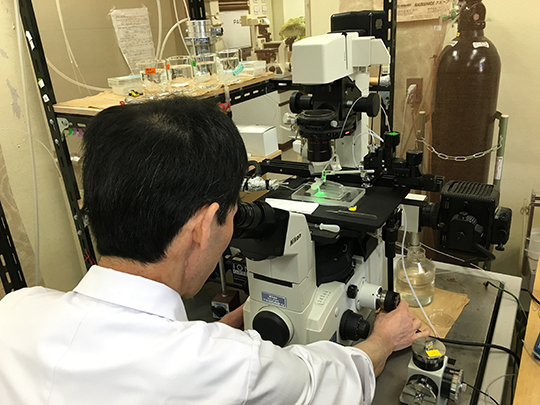 Omatsu-Kanbe M, Yoshioka K, Fukunaga R, Sagawa H, Matsuura H. A simple antegrade perfusion method for isolating viable single cardiomyocytes from neonatal to aged mice. Physiol Rep 2018;6(9):e13688. Kojima A, Fukushima Y, Ito Y, Ding WG, Kitagawa H, Matsuura H. TRPC channel blockers improve ventricular contractile functions after ischemia/reperfusion in a Langendorff-perfused mouse heart model. J Cardiovasc Pharmacol 2018;71:248-255. Sagawa H, Hoshino S, Yoshioka K, Ding WG, Omatsu-Kanbe M, Nakagawa M, Maruo Y, Matsuura H. Postnatal developmental changes in the sensitivity of L-type Ca2+ channel to inhibition by verapamil in a mouse heart model. Pediatr Res 2018;83:1207-1217. Fukumoto D, Ding WG, Wada Y, Fujii Y, Ichikawa M, Takayama K, Fukuyama M, Kato K, Itoh H, Makiyama T, Omatsu-Kanbe M, Matsuura H, Horie M, Ohno S. Novel intracellular transport-refractory mutations in KCNH2 identified in patients with symptomatic long QT syndrome. J Cardiol 2018;71:401-408. Toyoda F, Ding WG, Matsuura H. Heterogeneous functional expression of the sustained inward Na+ current in guinea pig sinoatrial node cells. Pflügers Arch. 2018;470:481-490. Wu J, Mizusawa Y, Ohno S, Ding WG, Higaki T, Wang Q, Kohjitani H, Makiyama T, Itoh H, Toyoda F, James AF, Hancox JC, Matsuura H, Horie M. A hERG mutation E1039X produced a synergistic lesion on IKs together with KCNQ1-R174C mutation in a LQTS family with three compound mutations. Sci Rep 2018;8:3129. Kojima A, Fukushima Y, Ito Y, Ding WG, Ueda R, Seto T, Kitagawa H, Matsuura H. Interactions of propofol with human voltage-gated Kv1.5 channel determined by docking simulation and mutagenesis analyses. J Cardiovasc Pharmacol 2018;71:10-18.